The July trade report is out. Exports are rising, but imports are rising even more. So our vast, humongous, enormous, out-of-control trade deficit continues its upward trajectory, sucking more jobs and money from our economy. Our deficit with China, of course, is the biggest factor. Why is it that DC elites worry endlessly about the budget deficit — already down more than half from the level left behind by Bush, falling faster than at any time since the end of the Second World War — but ignore the ever-increasing trade deficit? The budget deficit is largely money we owe to each other, while the trade deficit means we are losing jobs, factories and entire industrial ecosystems. In July, the overall U.S. international goods and services deficit rose to $39.1 billion, up from (revised) $34.5 billion in June. The U.S. goods deficit with Japan rose to $6.8 billion in July, up from $5.5 billion in June. Like the “green shoots” stories of economic recovery, there have been a flurry of media stories along the lines of “manufacturing returning to US.” Manufacturing has been increasing again, but is nowhere near recovering the jobs and factories lost to China. This is what a $30 billion per month trade deficit means. This chart of manufacturing employment shows that this increase is really just a blip compared to the massive job-losses suffered after China’s admission to the WTO. As a percentage of the workforce the numbers are even worse. 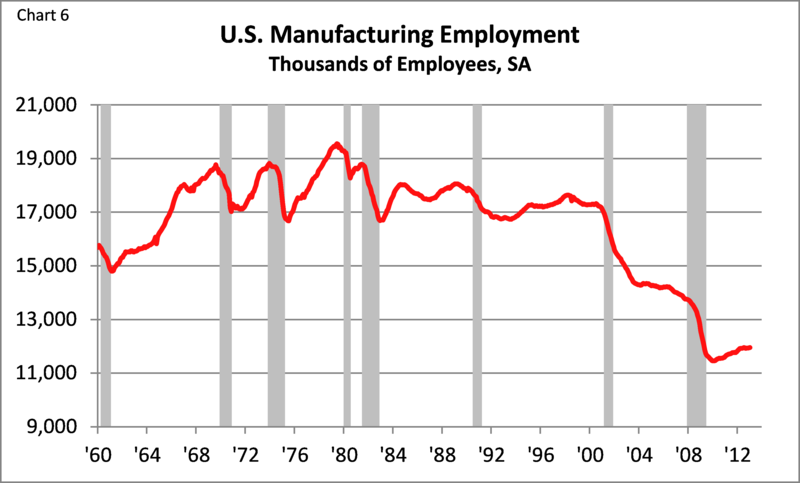 In June, 1977 22% of the nonfarm workforce was engaged in manufacturing. The last month of this chart, March 2012, this was down to 9%. U.S. manufacturing employment by month from January 1960 to January 2013. The huge drop in manufacturing employment that occurred during the 2000-2009 period is the effect of opening up “trade” with China combined with refusing to fight trade violations. And this is a key source of the job and income pressure that people are experiencing. We let companies close factories here, move the equipment to China, bring the same goods back to sell in the same stores, and call that “trade.” A few already-wealthy elites then pocket that wage difference, and the costs of protecting the environment and workers, while Americans go jobless and their communities decline. But we don’t just “let” companies do this, we give big tax breaks that practically force companies to do this. And we refuse to enforce trade rules against currency manipulation and other ways China subsidizes goods manufactured there because that puts even more money directly into the pockets of the very people profiting from closing our factories and shedding our country’s and people’s ability to make a living. To solve this problem the biggest factor would be to place a tariff on goods coming from countries that manipulate their currency. The second would be to change the “tax deferral” rules that let companies off the hook from taxes on profits from “outside” the country. A third would be to develop a national manufacturing strategy that understands that we are a country competing with other countries for the jobs and revenue of the future.